MAE WEST presented the trophy to Dave Johns in what was we believe her final public appearance. 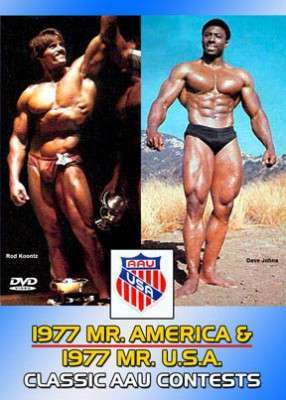 You’ll also see: Don Peterson, Tom Platz, Ron Teufel, Doug Beaver, Clint Beyerle, Pete Grymkowski and Manuel Perry. ’77 AAU Mr. America – See the full posing routines of the top 9 men, just as the judges saw them. You’ll see: Don Peterson, Tom Platz, Ron Teufel, Dave Johns, Doug Beaver, C.F. Smith, Clint Beyerle, Pete Grymkowski and Manuel Perry. Includes some compulsories from the Prejudging. There are fantastic posedowns of all the top men from each class, and intense “side-by-side” muscle battles. DAVE JOHNS won the title and later went on to win the NABBA Amateur Mr Universe crown in 1978. ’77 AAU Mr. U.S.A. – You’ll see these stars of the 70s: Rod Koontz (pictured above left), Billy Arlen, Richard Baldwin, Joe Means, Floyd Odom, and C.F. Smith. This was an intense battle, with Smith being disqualified by the judges for continual posing during the “stand relaxed” instruction from the judges. C. F. Smith did not do much wrong by today’s standards. He was hitting various quick poses when he was supposed to be standing relaxed. It may have been during the quarter turns of the prejudging but most likely it was during the final lot of comparisons as it happened after he had posed. It continued on, even after he was asked by by the head judge to stop flexing. Arnold got away with exactly the same thing at the 1980 Mr Olympia in Sydney! After a short time, the head judge’s patience ran out over this extra flexing. He stopped the prejudging and banished Smith from the stage. He was officially now out of the competition! It was a most controversial decision as SMITH was exceedingly popular with the huge crowd who felt some what cheated by his harsh exclusion. ROD KOONTZ won the overall title which possibly may have gone to Smith if it had not been for this incident! Draw your own conclusions from the RESULTS below. What amazes me is that Smith was listed as the class winner (disqualified) in the official results that I have. Normally his placing would be excluded and not revealed if this happened today. Maybe it was to make a point. C.F. Smith was a Medical Doctor, see cover photo below courtesy MD. This amazing USA contest segment runs approx 15 mins. Too bad I was not able to record the original sound track and words from the head judge! These 2 Classic Contests were filmed by Wayne Gallasch on silent Super 8 film, transferred to video and then to DVD with background music added. They are the only known film records of these 2 wonderful events. See Results and Photos below. We regret that it was not possible to film every single competitor in every class. In general only the top guys have been recorded.